A Neymar penalty and two excellent strikes from Gabriel Jesús gave Brazil a consummate 3-0 World Cup qualifying win over Ecuador in Quito last night; the Seleção’s first win in the city since 1983. It was an impressive way to kick start the Tite era for Brazil as they aim to get their World Cup qualification campaign back on track. With Argentina marginally defeating Uruguay and Chile losing to Paraguay in Asuncion, only two points separate Paraguay in 6th place (outside of the playoff spots) and Argentina in first. Victory pushes Brazil up into 5th and the playoff position, but with so few points separating so many teams, the victory takes on extra significance. Tite set Brazil up in his preferred 4-1-4-1 shape, surprisingly opting for two attacking full-backs in the shape of Dani Alves and Marcelo. Almost all of Ecuador’s attacking prowess is channelled down the flanks, via Antonio Valencia and Jefferson Montero. Ecuador like to press high up the pitch and force swift transitions and Brazil did struggle to get to grips with this approach early on. Renato Augusto and Casemiro often found the full-backs too advanced, leaving them without an out ball as Ecuador harangued them into turnovers. Only some poor final balls and some welcome interceptions from captain João Miranda prevented the home side from capitalising in the first half. But if Brazil’s midfield looked slightly disjointed, with the trio of Paulinho, Renato Augusto and Casemiro lacking creativity, the partnership between Neymar and Gabriel Jesús looked very promising from the off. The pair have spent the last month or so together in the Olympic squad, swapping the left flank and the centre forward role with impunity. Several times the pair combined in the first half, with either Renato Augusto or Paulinho surging forwards in support. But like Ecuador, occasionally the final ball was a touch over or under hit. Brazil’s midfield was guilty of shooting from difficult angles with Neymar and Jesús well placed for the pass. In the second half, Brazil had a much better technical stranglehold on the game in midfield. Ordinarily, teams tire in the altitude of Quito, but if anything, Brazil looked stronger as the game wore on. Ecuador got off to a flying start in qualifying, topping the CONMEBOL table in November. But momentum seems to have been arrested ever since; they drew at home to Paraguay in March and endured a fairly underwhelming Copa América campaign. Nevertheless, they qualified for the 2014 World Cup without losing in Quito and this represents their first loss at home in the current cycle. This was Brazil’s most impressive victory in qualifying by some distance. Tite recognised the pattern of the game midway through the second half and replaced the ineffective Willian with Philippe Coutinho, who offered a more creative outlet. The Liverpool man was willing to move in field and create space for Gabriel Jesús and Neymar, whereas Willian had played a much more ‘chalk on the boots’ role on the right. In the end, it was the energy and running of 19 year old Jesús that made the difference in the final quarter of the match. 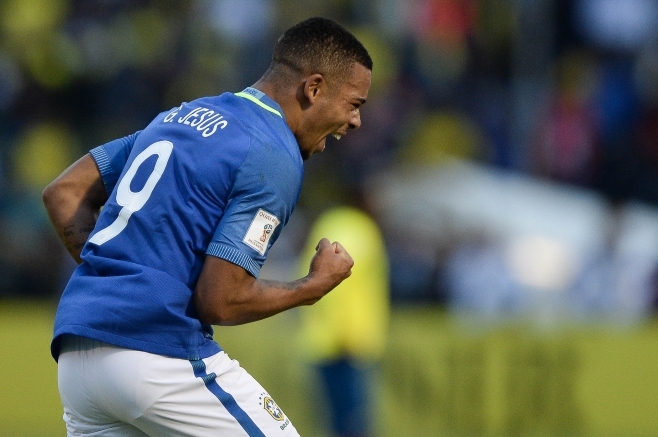 Arturo Mina underestimated Jesús’ burst of pace in the channel on 71 minutes, the Palmeiras striker nipped ahead of him and rounded keeper Dominguez, who swept Gabriel’s feet from under him. Dominguez was fortunate to escape with only a yellow card but Neymar coolly converted the penalty. From here, Brazil relaxed and finished the game emphatically. A wonderful pass from Neymar set Marcelo away in the left channel, the Madrid man’s cutback was impudently back heeled into the net by debutant Jesús at the near post. It was a technically wonderful finish that foxed the Ecuador ‘keeper. Brimming with confidence, the 19 year old added a third in stoppage time. Again, the move graduated down Brazil’s left hand side, Gabriel Jesús collected Neymar’s pass on the edge of the penalty area, using Coutinho’s overlapping run as a decoy, he lashed the ball past the goalkeeper from 18 yards. The number 9 role has ben a problem for Brazil for the last decade, but Jesús ought to solve this issue for the coming decade and more. Though caution is to be advised, similar predictions were formulated when a teenage Alexandre Pato arrived on the scene. In particular, the link up between Neymar and Jesús looks potent, with both players perfectly capable of rotating positions. Neymar has the slightly more creative edge, whilst Jesús has that explosive acceleration on the shoulder of the last defender. Yet Neymar is lethal enough to move more centrally and Gabriel Jesús technically gifted enough to run at players from the left hand side. It’s a heady cocktail in attack and one that Tite will be minded to drink to today. He will hope for more fireworks between the two when Brazil face Colombia in Manaus on Tuesday night. BRAZIL; 1.ALISSON, 2.DANI ALVES, 3.MIRANDA (c), 13.MARQUINHOS, 16.MARCELO, 5.CASEMIRO, 15.PAULINHO, 8.RENATO AUGUSTO, 19.WILLIAN (11.P.Coutinho ’61), 10.NEYMAR, 9.G.JESUS.